Sentinel-2 is the high-resolution optical satellite of ESA and the EU. 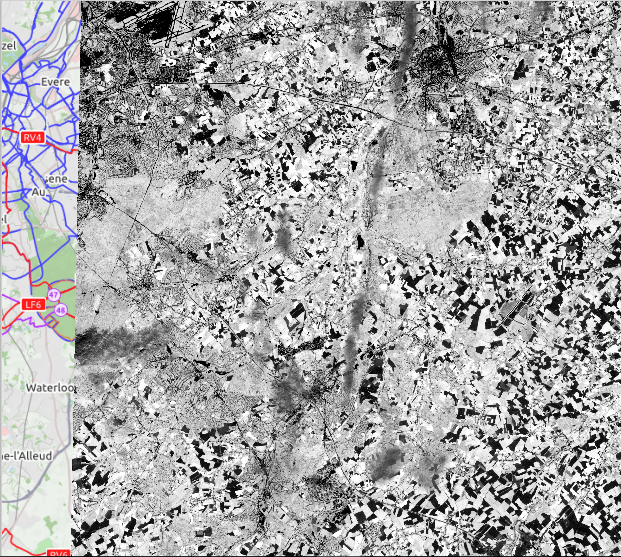 The images have a resolution of 10 to 20 meters, higher than Landsat, and, as always with the Copernicus programme, the data are free and open. In this tutorial, we’ll download an image, make it look good, and create maps of vegetation indices to show the general health of crops and other vegetation. 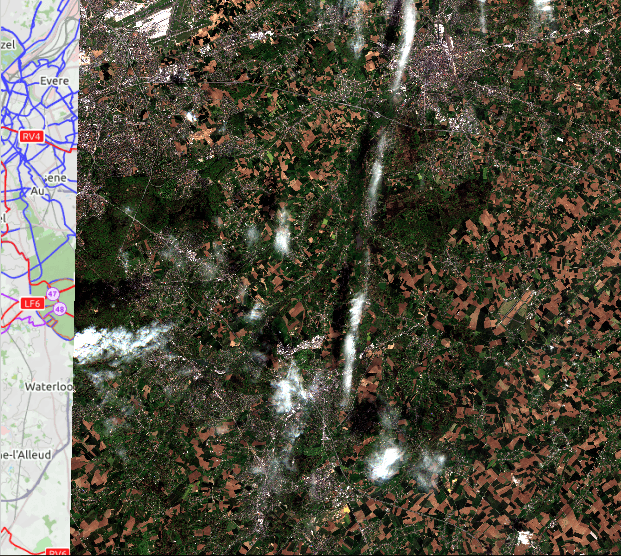 This is a basic tutorial, but even for those with experience in remote sensing, it is a good starting point for working with Sentinel-2 data. Short summary: We’re calculating vegetation indices from Sentinel-2 data to monitor crop health. “Semi-automatic classification plugin”. It can download tiles of 100 by 100 km, instead of the entire image, plus it processes it for you, and has some nice other tools. You can find a quick how-to on Youtube. Open up QGIS, and under Plugins –> Manage and install plugins, search for the plugin name (“Semi-automatic classification plugin”), and install it. 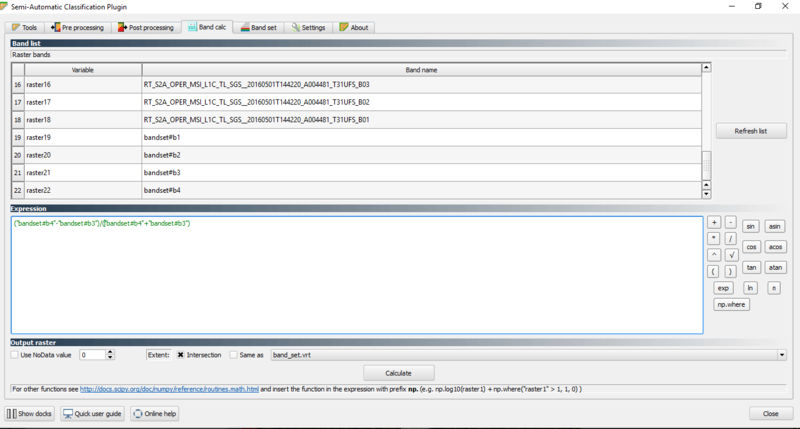 For me, the toolbar of this plugin appeared below the other toolbars in QGIS. Hover over the icons in the toolbar, and find the one that says “Tools” or “Semi-automatic classification plugin”. This will give you access to all the tools. Enter your login information that you use for the Sentinel hub. Press the PLUS sign under UL, and go to the map view in QGIS, and click on the upper left corner of your area of interest. Do the same for the lower right (LR) corner. Specify the time period you want to search images for. When the results return, all the granules (100x100km parts of the image) of an image covering your area of interest will be given. Play around with the “Display granule preview” to find the granule that covers your area of interest. When you’ve found it, select it, and click “Download granule from list”. Be aware that “Pre process images” is ticked off in the lower right corner of the plugin window, so make sure to turn it off if you don’t want it preprocessed! For the purposes of this tutorial, I left it on. This is just to make it easier to work – you can skip this step if you prefer. Let’s move on and get some information from the image! We’re going to calculate the Normalized Difference Vegetation Index (NDVI) and Normalized Difference Water Index (NDWI), to check the vitality of the crops, and their moisture content. If you want to learn more about the myriad of vegetation indices out there, check out this paper. The result is displayed in grayscale. To make the results easier to interpret visually, we’ll change the color palette. 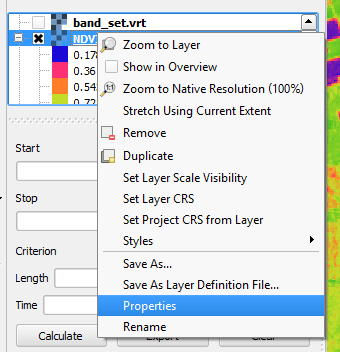 Right-click on the NDVI image in the Layers panel on the left, and click “Properties”. 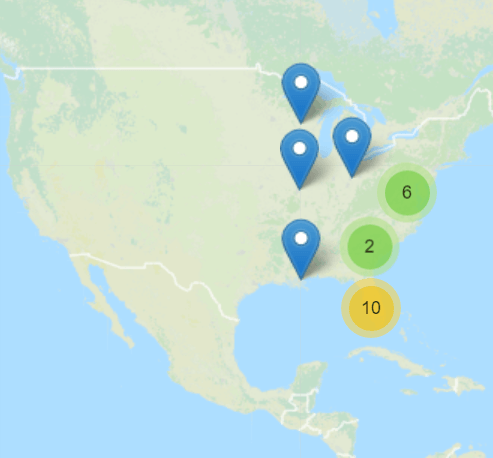 In the Style tab, choose “Singleband pseudocolor” as the Render type, tick off “Invert” in the Generate new color map box, and click “Classify” in the same box. Click “OK”. The NDVI image shows where vegetation is healthy and mature (red colors), while rivers and cities are shown in blue because of lack of vegetation. When you zoom in to a particular field, you can see variations in NDVI on the field, which indicates differences in crop health and maturity across the field. Farmers use this to finetune fertiliser spraying. To get more information on what could be the problem, when faced with a lower than expected NDVI, you can use the NDWI, which will indicate drought stress in crops. This document shows how it is used for operational monitoring of European crops with the MODIS satellites. Apply a pseudocolor palette to the NDWI results too. Higher NDWI values, shown as red colors, indicate high water content and high vegetation cover. 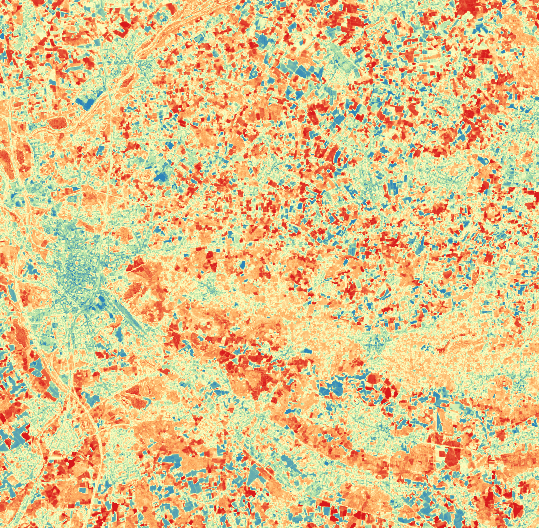 When we compare the NDVI to the NDWI, we can see where vegetation has a high density (red in NDVI results), but a low water content (yellow in NDWI). Which vegetation indices do you usually use for crop monitoring?